The Guadalajara-inspired hot spot on Lovers Lane invites you to join the party—if you can wait. You swim through the waves of noise and the crush of the crowd to the bar. It’s Thursday night and the scene at José is Playa del Carmen during spring break, pretty people in a pretty place having a pretty great time. It’s missing a swim-up bar but the presence of one is almost implied as you survey the room, hoping to alight at the turquoise-colored horseshoe counter, which seems to engulf half the space, stretching toward the floor-to-ceiling windows beyond which a beautiful tile fountain is crowned with a golden pineapple. They tell you it may be an hour before your table is ready. Not to worry. You’d been warned. And, besides, there are distractions: the truck that peddles street-style tacos next to the patio, the painted skulls and embroidered clutch purses on the shelves of the mercado tucked into the entryway, a reference to the street market of Guadalajara. Or simply watching those pretty people as they order frozen margaritas, good and golden, with all the virtues of Cointreau, fresh-squeezed lime, agave syrup, and top-shelf tequila. You could carry on like this, people-watching all night. But finally your party is summoned. It is 8:45 pm and you arrived at 7:30. The crowd has thinned, and there is a breeze on the patio. Fried calamari lands on your table, crusted with chicharrón, and you lose yourself in a reverie of chips and salsas, one tangy tomatillo, the other warm-roasted chile. 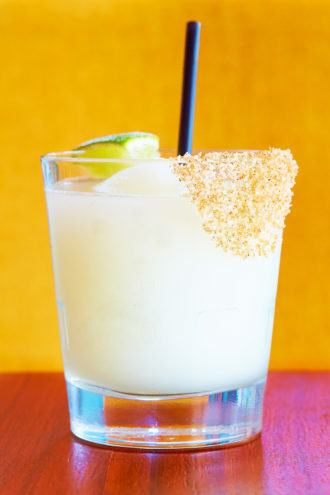 By now, the drinks—smoky with mezcal and maybe sweet with prickly pear or house tepache—have done their work. Those who threatened to stage a revolt have quieted; the tenor of the night is happy. You know already what you will order. When you could see at all through the thicket of people, you couldn’t help but notice plates bearing the most enticing fiestas. A quick glance at the appetizers (they all look good) secures a game plan. The half avocado stuffed with house-smoked salmon, a swish of yellow aioli and bright red chile de arbol dots accenting the plate, is beautiful. The avocados come out precisely at the peak of ripeness, when they slip from yellow to green in a subtle ombre. One evening, a ceviche del mar special is an excuse for half a Maine lobster and a cascade of seafood that tumbles into a pool of cool green tomatillo-avocado sauce, the lobster a magnificent comma, the rest of the dish an exclamation point. And if the striped bass ceviche and the house guacamole, both light on salt and lime, verge on blandness, they are simply missing lessons in depth they might learn from the charred street-style elotes with their queso añejo and hint of butter, some of the best elotes I’ve had in the city. 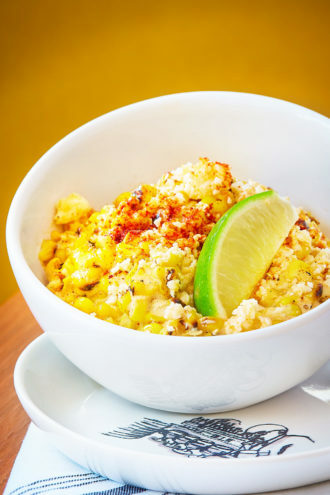 Megan and Brady Wood are the people behind this—the latter, for whom this is the 16th restaurant, in the business long enough to know how to approach contemporary Mexican. Photos from trips that friends and family have taken to Guadalajara over the last decade inspired the mural painted onto white tiles like a giant black-and-white line drawing against one wall, a fantasy montage of a real city. The Cerámica Suro factory in Guadalajara created the mural tiles (hand-painted, fired, shipped, reassembled like a giant puzzle), as well as the plates and the washbasins in the bathrooms. José is a passion project anchored by artisanry, not least that of its two chefs, Natalio Charles and executive sous chef Elmer Pineda, whose résumés include Meso Maya, El Bolero, and work with Avner Samuel. When I think of the food of Guadalajara, I think of earthy dishes like the torta ahogada, the “drowned” sandwich of fried pork swimming in vinegared chile de arbol sauce, or the spicy goat stew called birria. But here, at every meal, it’s the seafood that impressed. 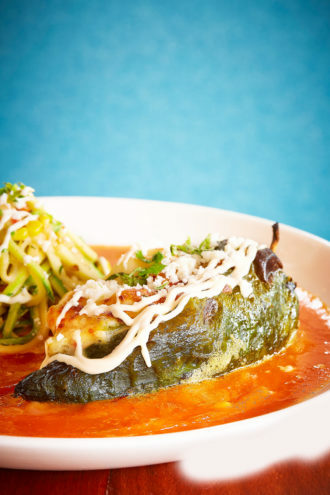 I loved the chile relleno, its salmon, shrimp, and calamari filling to the brim a roasted poblano pepper. It was blanketed with asadero cheese, giving it that particular magic that a melty cheese can have in a Mexican seafood dish, when it’s all tangled with crema and spices. Achiote lent a crimson blush and a light bitter kiss to an entrée of pure white halibut, whose julienne of chayote squash and roasted pineapple pico de gallo mingling with butter were both perfect and original. That they know what they’re doing is clear in the sauces. The smoky-sweet piloncillo chipotle that accompanies the calamari (and is best for the bell pepper strips), for example. Enchiladas suizas, a classic I first had in Mexico City, came lapped in a lovely green, tomatillo-based sauce whipped into an emulsion like a luxurious French preparation. Subtle tartness sneaks into places—the raw summer squash doused in chile and lime atop those enchiladas—and balances comforting plates. José taps into flavors with an immediacy I associate with my trips to Mexico City or Oaxaca, where flavors and ingredients are fresh and tradition is ever present. Beef tenderloin marries with supple blue corn tortillas in the Park Cities enchiladas. It’s another dish that has been composed visually: the chipotle cream sauce a fiery velvet that cloaks the dish in a color like pumpkin seed mole, the tortillas the pale blue of denim faded in the sun, all against the ceramic plate’s riot of color. What was there to say critically? There was nothing wrong, really, with the buttery sea bass with its piloncillo glacé, though what lay beneath was not to my liking, a murky pile of sautéed cabbage and bell peppers, vinegared and ignited with serranos. An imposing lamb shank came lavishly coated with a bold guajillo sauce. I get its purpose—combating the rich meat. But extravagantly sauced, with its hearty potatoes, it was daunting, like an outsize evocation of the torta ahogada. But, oh, the slow-cooked pork carnitas. They have all the hallmarks of good carnitas: a heap of crumbly bits and tender shreds surrounded by pickled radishes and cured white onions; roasted cherry tomatoes, for sweetness and a little acid bite; and the brilliant flash of a serrano-tomatillo sauce that cut the richness of those delicious pockets of unrendered fat, like hidden caramels. I ate the leftovers the next day and marveled again, the flavors and the presentation simple but awesome. For dessert, empanadas, with deep-fried cinnamon graham cracker crumbs around a sweet potato filling. A huge blue cornmeal cookie is barely sweet, like a blue corn cornbread. In part because its crumb is dry, but also because the indigenousness fits, I found it easy to imagine alongside a mug of spiced Mayan drinking chocolate. The Mexico José presents is vibrant and native but touristy, too. There is much to like. Not least the little mercado where I found the hand-felted woolen animal I took home after a long, loud night. Squint your eyes and there is a beach.